Advanced Computer Group, Inc. is an innovative company directly resulting from 20 plus years of technical experience. 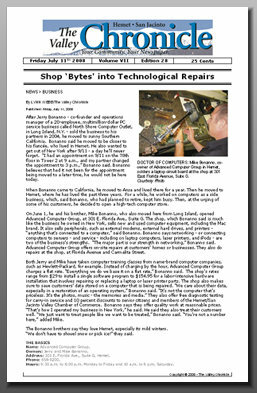 After successfully running a multi-million dollar PC repair service in Long Island, NY, brothers Jerry and Michael Bonanno relocated to sunny Southern California bringing with them their business ethics and reputation for outstanding service. Their skilled technicians are authorized by the industry’s top organizations including HP, Compaq, Okidata, Intel, Microsoft, and Novell. "We take pride in the work we do and the service that we provide."